Here is an incredible example of how beauty in design can combine harmoniously with practicality and durability to create a modern desk that you’re going to love. 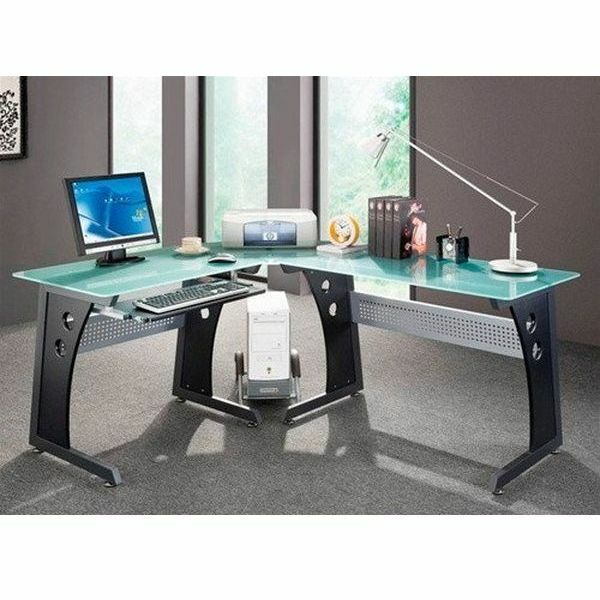 The L-shaped design of this extremely modern desk comes with unique features such as a frosted tempered glass for the main desk area, a mobile CPU caddy, front privacy panels made with the strength of perforated steel, a pullout keyboard drawer with safety stop to keep it from pulling too far, and legs that have been made with MDF and matching PVC black laminate. And, it is also available in Graphite. With so many fantastic and truly unique features that come together into such an awe-inspiring design, this is definitely going to become one of your favorite owned items! 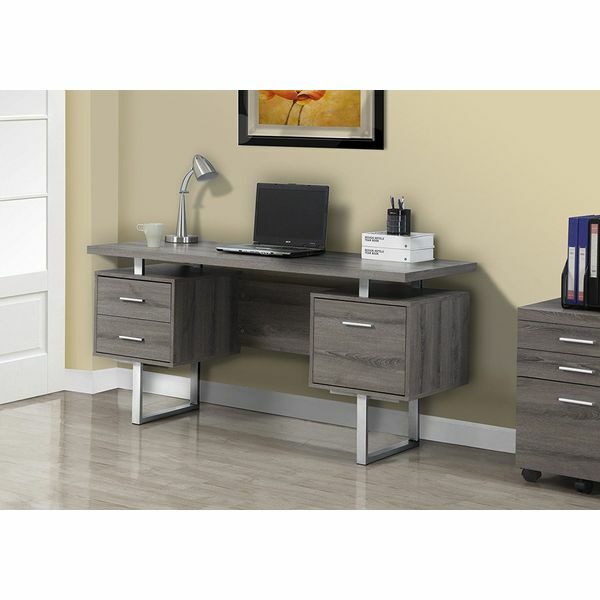 The Monarch Specialties Dark Taupe Office Desk takes modern desks to a new level. 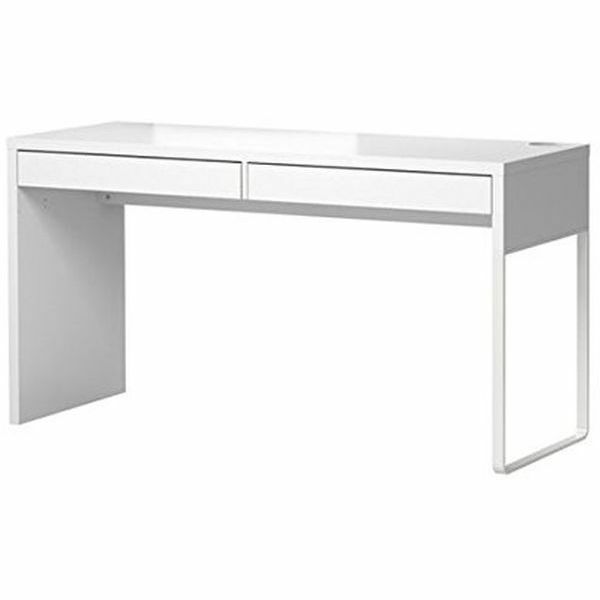 The desk features two storage drawers on one side and one drawer on the other, supported by a slim metal beam. It has a floating worktop surface, all of which sits on sleek metal track legs. Upgrade your office space with the Baxton Studio Idabel Dark Brown Wood Modern Desk. The desk features an engineered wood frame with rubberwood veneers that have been given a dark espresso finish. There is a clear, tempered glass desktop and a sliding keyboard that comes with storage space. 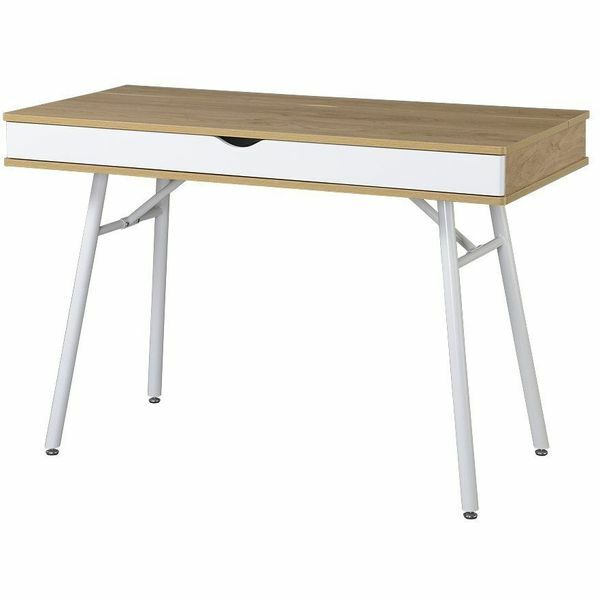 With its blend of white hues and light-colored wood, the Techni Mobili Modern Computer Desk with Storage is the perfect addition to any modern work space. The desk is simple and straightforward with a standard worktop and a large, long drawer that pulls out for storage. Here is everything you’ll ever need when it comes to the perfect modern computer desk. It’s modern – with an airy, three piece desk that comes complete with a CPU stand and sliding keyboard tray. It’s durable – made from chrome-finished steel tubing and tempered safety glass to ensure a long lifetime of use. It’s user friendly – featuring a space-saving and versatile L-shaped design that fits into practically any corner, and coming with a keyboard that can mount to either side. Everything you’ll ever need, in one beautiful, modern, durable and user-friendly package (which ships ready to assemble)! A long table top makes it easy to create a workspace for two. Finished on the back. Suitable for use as a room divider. Drawers with stop keeps them in place. Do you need workspace for two, but just don’t have the actual space to do it comfortably? Here is the solution to your problem! This desk has been specifically created with a long tabletop that makes it easy for two people to use the same workspace without being cramped. And its incredibility doesn’t stop there: cable outlets and compartment in the back keeps your cords and cables out of sight, but still close at hand. 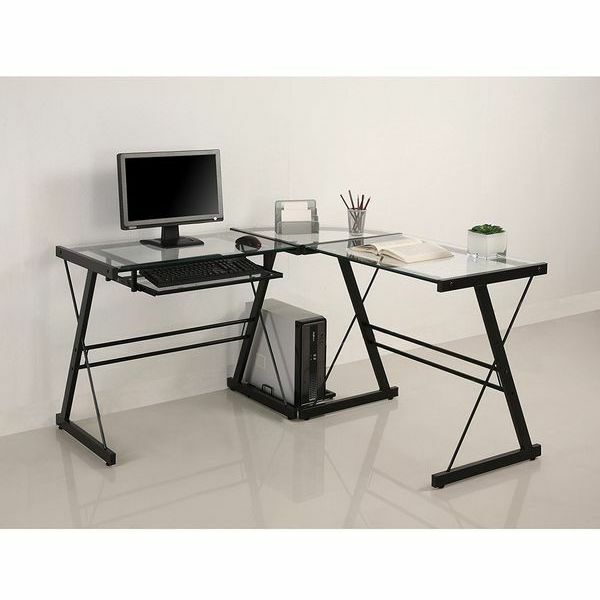 The legs can be mounted to the right or left, making this desk wonderfully user friendly and adaptable to your needs. It is finished on the back making it fantastically suitable as a room divider. And, drawers come with stops to keep them in place so you never have to worry about them sliding all the way out. This desk is perfect for college dorm rooms, couples without their own office space, businesses just starting out or just for anyone that really enjoys extra space!